British Artisan & Urban Cheese Wholesaler. Supplying to the catering and retail trade across London. The Cheese Merchant is a distributor of the finest British and urban artisan cheeses to the UK catering trade. We select cheese from the best producers around the country and supply them to some of the top restaurants, shops and caterers around London and the UK. Urban cheeses are a new and really exciting part of our business. We source cheeses produced in UK towns and cities, offering local produce to chefs and shops. In turn, we are helping them in supporting local economies and the environment by reducing food miles. We have a fantastic range of urban cheeses, if you are interested to find out more, please get in touch. We know that having the best cheeseboard in town is essential! So, please get in touch to request a brochure, arrange a meeting or a tasting. The Cheese Merchant was founded by ex-Chef and cheese specialist, George Lang. George spent many years working as a chef in high-end and Michelin Starred restaurants before moving into the cheese industry. 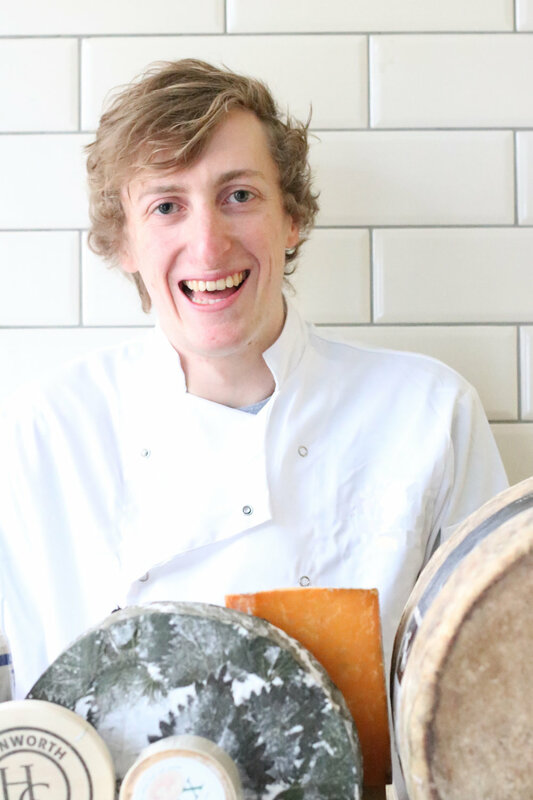 George's specialist knowledge and passion for British, artisan cheeses has lead him to set up The Cheese Merchant. As a farmer's son himself, he is eager to support British farmers across the UK in his venture.